Rescue operation in Meghalaya coal mine. File image. 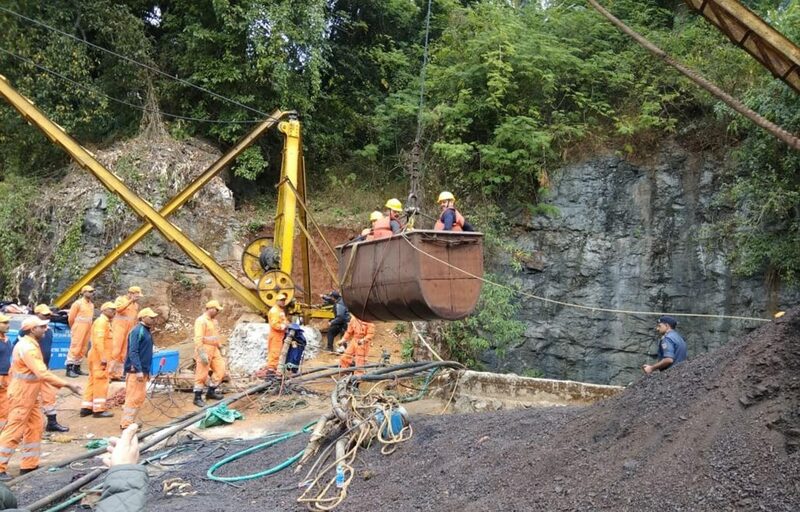 The Indian Navy team engaged in the search of the 14 miners trapped inside an illegal, 370-feet flooded coal mine in Meghalaya’s East Jaintia Hills district resumed their operation on Tuesday. The operation was suspended three days earlier for equipment maintenance. Out of the 15 miners trapped in the ‘rat-hole’ mine in December last year, the Navy had found and retrieved the body of one on January 23 last. Another body was detected on January 26 but it is yet to be retrieved due to high turbidity of the water inside the mine. On Tuesday the spokesperson of the rescue team Reginald Susngi told media persons that the Indian Navy rescue team resumed their search and rescue operation with the ROVs in the main shaft and the search is going on in the rat-hole where the 14 miners are trapped, now believed to be dead. The apex court, which is monitoring the rescue operations, has directed the government that the trapped miners have to be taken out of the coal mine whether ‘dead or alive’.